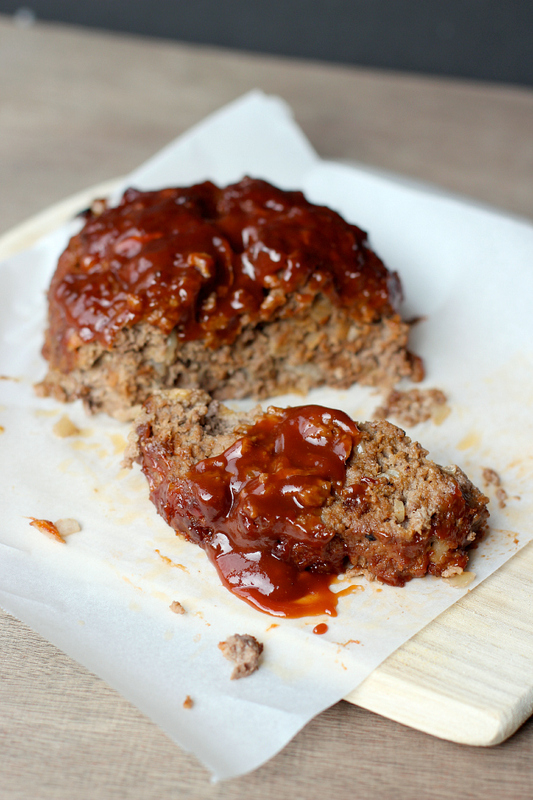 In an attempt to better educate myself in the art of meat eats, I dove into my very first meatloaf. And if you want to try this one too, you have to be down with garlic and beef fat. …because all that is tucked inside. And much like a cheesecake whose surface cracks, I can’t say the scarred top of this meatloaf affected the rate at which it was demolished either. A key component? The french bread crumbs. It doesn’t require much of a loaf, but not to worry. The remainder can be baked in butter and doused with garlic perfume along side your sauced mound for a speedy meal. Oh, and the meatloaf sauce? Rock star. A great recipe to get the beef brainstorming a-brewing. Preheat oven to 350F. Grease a baking dish with butter. 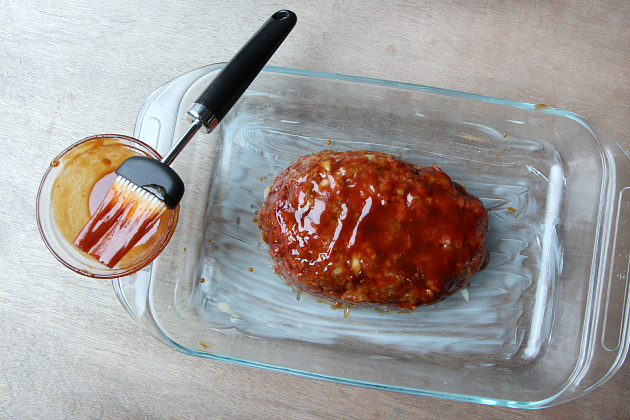 For The Meatloaf Sauce: Pour all ingredients into a sauce pan and heat while whisking until very warm, shiny and thoroughly combined. Divide in half and set aside. 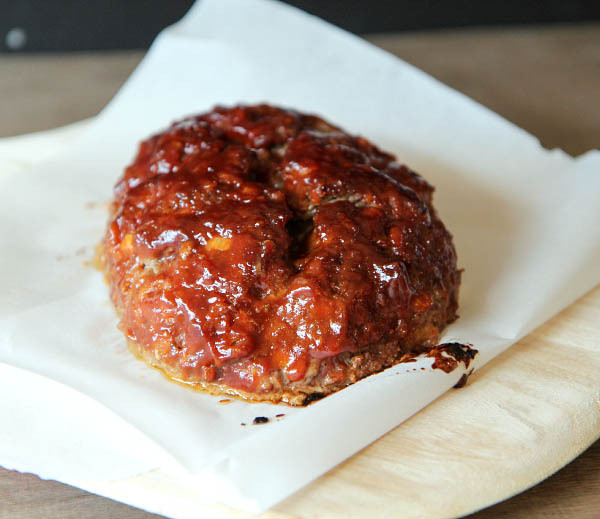 For Meatloaf: Place bread crumbs and buttermilk into a small bowl and stir to combine. Separately, place all remaining meatloaf ingredients together. Add moistened bread crumbs. Stir entire mixture gently, making sure not to over mix. Form mixture into a loaf shape and place in a greased baking dish. Smother with one of the portions of sauce. Bake in preheated oven for 45-55 minutes, until a meat thermometer reads 160F. When removed from oven, use half of the remaining portion of sauce to coat the outside. Allow meat to cool in pan for 10 minutes before slicing or removing. Once sliced, pour some clear juices from the pan onto the slices and then top with remaining half of sauce. Enjoy! 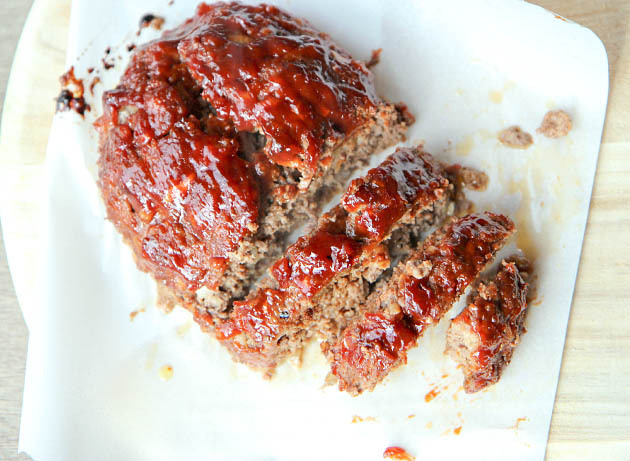 This entry was posted in meat, recipe, savory and tagged bbq ketchup sauce, easy dinner recipe, easy meatloaf, easy meatloaf recipe, fast dinner recipe, ground beef recipe, meatloaf. Bookmark the permalink. Oh my!! Meatloaf!!! Oh, how I’ve missed thee!! Looks great, Jess!! !